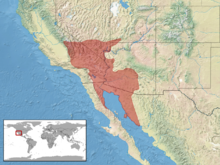 In the southwestern United States, this species is found in the desert region of south eastern California, southern Nevada, southwestern Utah, and western Arizona. In northwestern Mexico, it is found in western Sonora and eastern Baja California. The species is nocturnal during hot months and diurnal during the cooler months of its activity period, which is roughly from November to March (probably longer in the southern part of its range). Neonatal sidewinders engage in a remarkable behavioral homeothermy that has not been observed in any other type of snake. Following birth, the neonates mass together in their natal burrow. Most often, gravid females select an east-facing, small-diameter rodent burrow for giving birth. For the first week or so of their lives, neonatal sidewinders literally plug the entrance to this burrow during daylight hours, forming a dynamic multiple-individual mass that takes advantage of the hot exterior environment and the cool interior of the burrow to maintain an average aggregate temperature of 32 °C (the optimal temperature for shedding). The dynamic mass of neonates modifies the thermal environment at the burrow entrance such that the young can occupy a location that would ordinarily become lethally hot for an individual neonate (or even an adult). Because of the constant movements of the neonates, the aggregate assumes stable temperature properties reminiscent of a homeothermic organism (i.e., maintains tight temperature tolerance ± 2 °C). Females produce up to 18 young, with an average of about 10 per litter. Like most other viperids, the young are born enveloped in thin embryonic membranes, from which they emerge shortly after being expelled from the mother. The young stay with their mother in a burrow for seven to 10 days, shed for the first time, then leave their natal burrow. During this time, the mother is thought to guard and protect them from predators. Sidewinders have an extraordinarily accelerated lifecycle, with natural life expectancies of females of about five years. Males may live quite a bit longer (maximum known natural lifespan of 13 years). Sidewinders can live more than 20 years when well fed in captivity (even females). Thus, energetics apparently factor heavily into natural female mortality,  whereas predation might be the primary pressure on males. In the wild, females often die of exhaustion after giving birth, but the lives of sidewinders are also cut short by predation, diseases, and vehicle encounters. These snakes are venomous, but possess a weaker venom than many other rattlesnakes. This, together with the smaller size of their venom glands, makes them less dangerous than their larger relatives. Still, any rattlesnake bite can be fatal and should be taken seriously and medical attention sought immediately. Ovine-derived antivenom, CroFab, for North American pit viper envenomation has been widely available since 2001. Consultation with a local expert or regional poison control center should be obtained before administering antivenom. The previous antivenin (ACP) is no longer manufactured. ^ a b Frost, D.R. ; Hammerson, G.A & Gadsden, H. (2007). "Crotalus cerastes". IUCN Red List of Threatened Species. Version 2007. International Union for Conservation of Nature. Retrieved 5 June 2017. ^ a b c d e f g Wright AH, Wright AA. 1957. Handbook of Snakes. Comstock Publishing Associates. (7th printing, 1985). 1105 pp. ISBN 0-8014-0463-0. ^ a b c "Crotalus cerastes". Integrated Taxonomic Information System. Retrieved 5 February 2007. ^ a b Campbell JA, Lamar WW. 2004. The Venomous Reptiles of the Western Hemisphere. Comstock Publishing Associates, Ithaca and London. 870 pp. 1500 plates. ISBN 0-8014-4141-2. ^ a b Stidworthy J. 1974. Snakes of the World. Grosset & Dunlap Inc. 160 pp. ISBN 0-448-11856-4. ^ Behler JL, King FW. 1979. The Audubon Society Field Guide to North American Reptiles and Amphibians. New York: Alfred A. Knopf. 743 pp. LCCCN 79-2217. ISBN 0-394-50824-6. ^ Carr A. 1963. The Reptiles. Life Nature Library. Time-Life Books, New York. LCCCN 63-12781. ^ a b Marvi, Hamidreza; Gong, Chaohui; Gravish, Nick; Astley, Henry; Travers, Matthew; Hatton, Ross L.; Mendelson, Joseph R. III; Choset, Howie; Hu, David L.; Goldman, Daniel I. (10 October 2014). "Sidewinding with Minimal Slip: Snake and Robot Ascent of Sandy Slopes". Science. 346 (6206). ^ Reiserer, R. S. and G. W. Schuett (2008) Aggressive mimicry in neonates of the sidewinder rattlesnake, Crotalus cerastes (Serpentes: Viperidae): stimulus control and visual perception of prey luring. Biological Journal of the Linnean Society 95:81-91(11). ^ a b c Reiserer, R. S., G. W. Schuett, and R. L. Early (2008) Dynamic aggregations of newborn sibling rattlesnakes exhibit stable thermoregulatory properties. Journal of Zoology 274:277-283(7). ^ a b c d Reiserer, R. S. 2001. Evolution of Life Histories in Rattlesnakes, University of California, Berkeley. Advisors: Harry W. Greene and James L. Patton. ProQuest Digital Dissertations: http://wwwlib.umi.com/dissertations/gateway. Hallowell, E. Descriptions of new Reptiles from California. Proc. Acad. Nat. Sci. Philadelphia 7: 91-97. 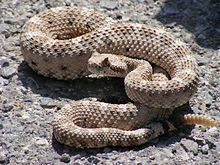 Wikimedia Commons has media related to Crotalus cerastes. Crotalus cerastes at the Reptarium.cz Reptile Database. Accessed 3 August 2007.